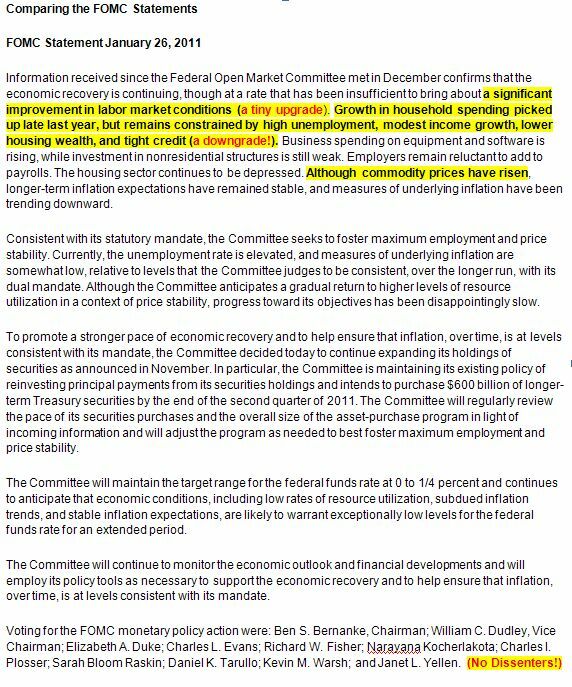 Information received since the Federal Open Market Committee met in November confirms that the economic recovery is continuing, though at a rate that has been insufficient to bring down unemployment (offsetting changes). Household spending is increasing at a moderate pace (an upgrade! ), but remains constrained by high unemployment, modest income growth, lower housing wealth, and tight credit. Business spending on equipment and software is rising, though less rapidly than earlier in the year, while investment in nonresidential structures continues to be weak. Employers remain reluctant to add to payrolls. The housing sector (from housing starts) continues to be depressed. Longer-term inflation expectations have remained stable, but measures of underlying inflation have continued to trend downward. To promote a stronger pace of economic recovery and to help ensure that inflation, over time, is at levels consistent with its mandate, the Committee decided today to continue expanding its holdings of securities as announced in November (just an adjustment of words to accommodate Nov announcement). The Committee will maintain its existing policy of reinvesting principal payments from its securities holdings. In addition, the Committee intends to purchase $600 billion of longer-term Treasury securities by the end of the second quarter of 2011, a pace of about $75 billion per month. The Committee will regularly review the pace of its securities purchases and the overall size of the asset-purchase program in light of incoming information and will adjust the program as needed to best foster maximum employment and price stability.